Yesterday in the Pepperdine University green room, Billy made a comment about the tune I had just been running minutes earlier during soundcheck. I had been playing through the changes to Thelonius Monk’s Evidence which he recognized. We fell into a rangy conversation about jazz, Rahsaan Roland Kirk, NYC in the 80’s, and madman Charles Manson. Both Monk and Horace Silver came up in the same sentence during the jazz portion of the discussion. I scrambled through my iPhone to try and find the version I have of Mysterioso that they play on together (on a session with Sonny Rollins.) I misfired and played the wrong Rollins cut: his version of The Way You Look Tonight. Yeah, I am shilling a product right now, but this program is truly great. I am constantly having to learn music, this makes it so much easier. I have tried a few others over the years, (one being Transcribe which is also very good,) but this one seems to have it all. Very intuitive. There is both a desktop and smartphone platform. Most nights, right after my daughter’s bath we have cartoon time. This is big stuff around here and has become our only real threat-leverage during the day. (Not ashamed to resort to hostage taking to get stuff cleaned up.) Anyway, we watch some Peppa Pig videos on youtube or The Lorax. If the mood is right, I ‘ll throw in some live Bill Withers moments, or Monk, Pops- things that will undoubtedly get an eye-roll in a few years. (I even got Sonny Sharrock past the censor for about a minute and a half.) Much of my energy goes to steering the programming to what a 3 year old and her old man might have in common. Not surprisingly The Muppet Show really holds up. And you can totally feel the close relation to music that Jim Henson and his bunch must have had. One of my favorites is this, the sideman’s dilemma. I LOVE musicians. I love to be around them, their sense of humor, their strange perspective on life... Most of my friends are ‘lifers’ and they are wide-open in every aspect I can think of. These days I am more excited about music and my place in it than I have ever been. Still… the realist in me can’t help but chew on the subtext (or general lack of) in the lion’s share of what’s out there in the mainstream. Even the so-called ‘creative’ artists in the general culture are really bereft of any craft or content I could possibly care about. This made me laugh pretty hard then stuck with me. Tonight Mah-na Mah-na hit me as an allegory for the modern-day music biz: the widening gulf between the joyful, creative impulse to push boundaries (here it is to improvise,) and the brain-dead, determined pursuit of the obvious (a bovine pair of pink Forrest Gumps.) I do love popular music. But these days most productions seem to be so much over-hyped musical Lego with an auto-tuned amateur skating on top. In a weak moment it can be really depressing. The hepcat riffing on Lullaby Of Birdland rejects conformity by retreating into self-imposed exile. While he seems to get the last word, I think it’s the two wealthy old codgers in the box seats who really represent public opinion: “The question is, what is Mahna Mahna?” one asks. “The question is… who cares?” says the other. And yet, music remains IT for me and I know it will always be. I think most musos would agree that a life pursuing music is vocational at the core. I am especially comforted by company of my peers who blow my mind daily. Never have the stakes been so low, with so much more static to cut through. And still, watching my friends play in this new landscape, witnessing them trying to move music forward, sometimes even getting to be a part their process... all of that is inspiring. Final observation: A lot of the Muppet Show’s musical conflicts end with the troublemaker exploding! sigh. I got into JJ when I was a Pastorius-obsessed kid. I read an interview where Jaco claimed that he was merely a ‘bad Jerry Jemmott imitation’ and I scrambled to find whatever recordings I could. He is truly one of the all-time greats on the electric bass. He has that perfect Fender sound and the idiosyncratic, funky stagger that just makes every track he plays on feel like a million bucks. 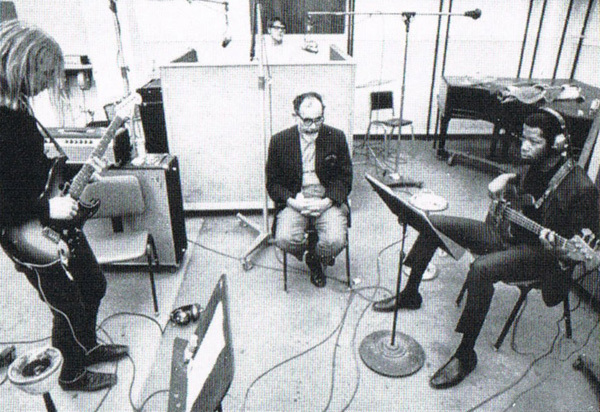 Jerry in the studio with Duane Allmann and Atlantic’s Jerry Wexler. I go back again and again to my copy of Freddie King’s ‘My Feeling For The Blues’ (containing great Donny Hathaway horn arrangements.) It is a great transitional record blending the blues and soul in a way that I have always dug. BB King’s Live and Well runs a close second but there is a real soulful, gritty elegance about this LP that has always hit home for me. There are many great Jemmott tracks to check out from the classic King Curtis LP’s to what I consider to be the greatest live soul record ever: ‘Aretha Live at The Filmore.’ It’s not just limited to the Atlantic soul era either- Jerry has been active and doing the good work his entire career- he currently is a member of The Greg Allman band. But here’s an older one I only just recently found myself: The Voices Of East Harlem. Ebay vinyl is on the way!